At Glenwood we believe in harnessing the power and endurance of machinery to manage tree work with greater efficiency, ease and safety. We are innovators – Glenwood was the first company in our market to innovate with rear lift gates on our forestry trucks. That mechanization facilitates the heavy work at the end of a tree removal and delivers the added benefit of reducing physical demand on our crew at a time when that relief is needed most. For site clearing, our John Deere wheel loader adds to productivity by moving multiple pieces of wood at one time. Stump grinding is accomplished quickly and thoroughly by our two stumpers. Large stumps are no match for our Vermeer 110 horsepower machine. 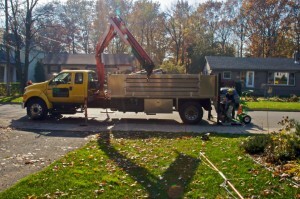 We require a minimum width clearance of 36″ to get our machines into backyards or gated areas. Once you make a decision to have tree work done, you’re eager to see it completed. That’s why we believe in bringing the right equipment to your job. It’s all about getting your work done efficiently with the greatest degree of safety possible. Copyright © 2019 Glenwood Tree Service Inc.